I choose to do this because every gospel sharing conversation I have comes at unplanned moments and this script allows me to be prepared. Visual (for those visual learners). I can make it my own and customize on the fly. I can use questions to keep it conversational. David Fitch has a good series of posts and discussion about some of the theological questions about the Bridge as a gospel script. The comments raise great issues, and point to some other scripts. (See also Part 2 and Part 3). All you really need is a writing surface and a instrument. I’ve used markers on a whiteboard, pens on a napkin, my kids’ crayons on the back of a paper placement in a diner. Draw two lines horizontally, making two columns. Write God on the right side line and draw a little stick figure on the left. I space about 2 or 3 inches between them. Explain about the separation between the person and God. Most times when I share this illustration, the person I’m speaking with is well aware of the Separation — that’s why they are look for God to start with. You can draw two vertical lines from the inside of the horizontal lines to show a cliff of separation. A good verse to share here is Romans 3:23, and I might write the word sin or separation at the bottom of the gap. Another might be Hebrews 9:27 about the coming judgment for our sin. I explain that people try to reach God through all sorts of means: drugs, philosophy, good deeds. I ask the person I’m talking with the share with me what things they have tried to do to reach God. That helps me to discern where that person is spiritually, and helps to suggest the next part of the conversation. Perhaps there is something to debate, discussion, or an objection to resolve. Perhaps a person wants more time to consider what is being heard. Here is another video I found on You Tube. If you want live coaching on using gospel scripts, see our 1-1 mentoring program. We’ll be glad to provide distance training, or live in person Contact us for more info. I use a bridge illustration, i guess it is an adaption of the bridge that I think is more clear and more simple while incorporating a holistic approach. It is not just about your sin and God but talks about how we have inherited sin from Adam. email me and I can email it to you. Thanks for stopping by. Feel free to email me what you’ve got and I’ll add it to this series of scripts. Each script by nature will be simplified to the exclusion of certain favorite elements. This is one of the big critiques of using a script. However, scripts are helpful tools to learn so that one can be comfortable in sharing your faith. 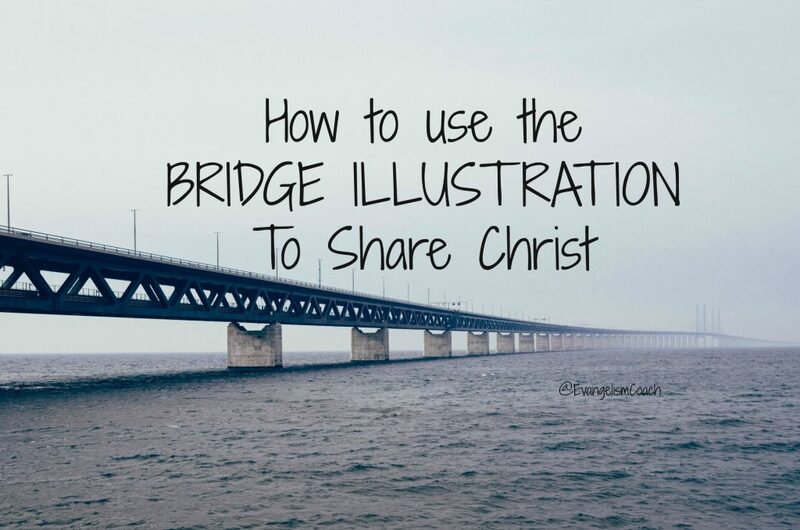 I created a New and different kinds of bridge illustration, I called it the ED BRIDGE ILLUSTRATION (Evangelism and Discipleship Bridge Illustration). Please check. I hope it will help.